Go to original pattern for design DROPS 102-28. 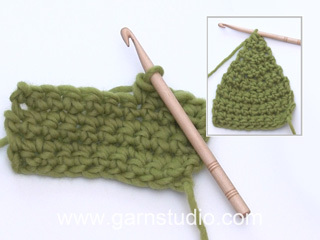 DROPS crochet hook size 8 mm – or the crochet hook size needed to obtain correct crochet tension. 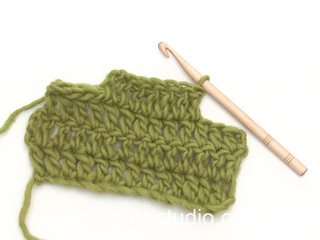 Crochet info: Turn each row with 1 ch. Decreasing tip - 1 (slanted side): Dec 1 sts on each side crocheting 2 outermost dc tog, by slipping first dc and picking yarn, then into second dc picking yarn, yo and pull yarn through all 3 sts on crochet hook. Cast off at end of row by crocheting to number of dc to be cast off and then turn piece. Cast off at beg of row by crocheting sl st over number of dc to be cast off. 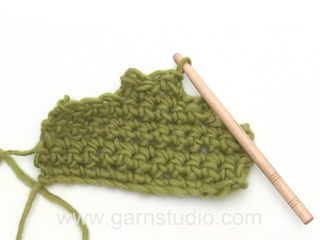 Increasing tips: Increase 1 sts on each side by crocheting 2 dc in first and last dc of row. Crochet 59-64-70-75-83-88 ch (incl 1 ch to turn with) on crochet hook size 8 mm with Highlander. Crochet 1st row as follows: 1 dc in 2nd ch, 1 dc in each of next 2 ch, skip 1 ch, * 1 dc in each of next 3 ch, skip 1 ch * repeat from *-* and finish off with 1 dc in each of last 2-3-1-2-2-3 ch = 44-48-52-56-62-66 dc. Continuing crochet 1 dc in each dc – read Crochet info. When piece measures 15 cm dec 1 dc – see Decreasing tip - 1 on each side of every 15th -16th -17th -18th -19th -20th cm 3 times in total = 38-42-46-50-56-60 dc. Read next entire section before crocheting commences! 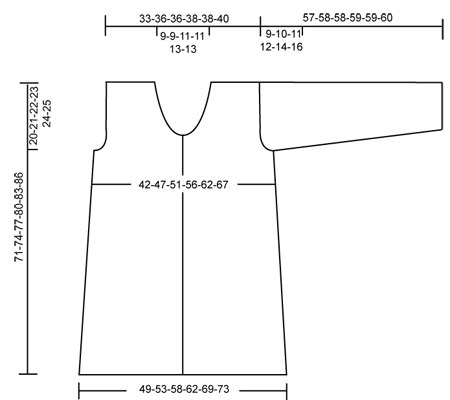 When piece measures 51-53-55-57-59-61 cm dec 3 dc on each side for armhole – see Closing off tip - 2. Continuing dec 1 dc on each side on every row 1-2-4-5-8-9 times in total = 30-32-32-34-34-36 sts. When piece measures 69-72-75-78-81-83 cm do not continue crocheting over middle 8-8-10-10-12-12 dc = 11-12-11-12-11-12 dc left on each shoulder (complete each side separately). 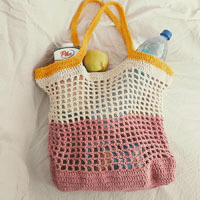 Crochet until piece measures 71-74-77-80-83-86 cm. Cut yarn. Crochet 38-40-43-46-51-54 ch (incl 1 ch to turn with) on crochet hook size 8 mm with Highlander. Crochet 1st row as follows: 1 dc in 2nd ch, 1 dc in each of next 2 ch, skip 1 ch, * 1 dc in each of next 3 ch, skip 1 ch * repeat from *-* and finish off with 1 dc in each of last 1-3-2-1-2-1 ch = 28-30-32-34-38-40 dc. Continuing crocheting 1 dc in each dc. When piece measures 15 cm dec on side as on back = 25-27-29-31-35-37 dc. When piece measures 51-53-55-57-59-61 cm dec for armhole like back piece. At the same time when piece measures 59-62-63-66-67-69 cm dec 5 dc towards mid front for neck. Continuing dec 1 dc towards neck on every other row 5-5-6-6-8-8 times in total. When all dec are completed 11-12-11-12-11-12 sts are left on shoulder. Cut thread when piece measures 71-74-77-80-83-86 cm. Size S: 26, 34, 42, 50 and 58 cm. Size M: 26, 33, 40, 47, 54 and 61 cm. Size L: 27, 34, 41, 48, 55 and 62 cm. Size XL: 25, 33, 41, 49, 57 and 65 cm. Size XXL: 26, 34, 42, 50, 58 and 66 cm. Size XXXL: 26, 33, 40, 47, 54, 61 and 68 cm. Crochet 27-30-30-31-31-34 ch (incl 1 ch to turn with) on crochet hook size 8 mm with Highlander. Crochet 1st row as follows: 1 dc in 2nd ch, 1 dc in each of next 2 ch, skip 1 ch, * 1 dc in each of next 3 ch, skip 1 ch * repeat from *-* and finish off with 1 dc in each of last 2-1-2-2-1 ch = 20-22-22-23-23-25 dc. Continuing crochet 1 dc in each dc. At the same time when piece measures 8 cm inc 1 dc on each side – read Increasing tip – on every 7th -7th-6th-5th-4th-4th cm 6-6-7-8-9-9 times in total = 32-34-36-39-41-43 dc. When piece measures 48-48-47-47-45-44 cm cast off 3 dc on each side. Then cast off to shape sleeve top on every other row as follows: 2 dc 1-1-1-2-2-2 times and 1 dc 1-1-2-1-2-3 times. Continuing, cast off 2 dc on each side until piece measures 55-56-56-57-57-58 cm. Now cast off 3 dc 1 time on each side. 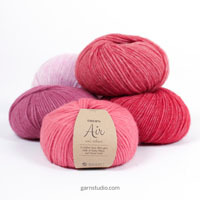 Cut yarn. Crochet another sleeve. 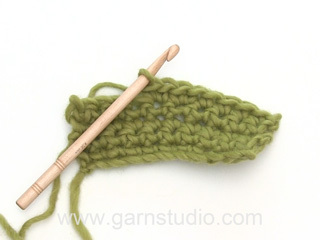 Decorative pockets: Crochet 18-18-20-20-22-22 ch (incl 1 ch to turn with) on crochet hook size 8 mm with Highlander. Crochet 1st row as follows: 1 dc in 2nd ch, 1 dc in each of next 2 ch, skip 1 ch, * 1 dc in each of next 3 ch, skip 1 ch * repeat from *-* and finish off with 1 dc in each of last 1-1-3-3-1-1 ch = 13-13-15-15-16-16 dc. Continuing crochet 1 dc in each dc until approx 6-6-6-7-7-7 cm is crochet. Cut yarn. Assembly: Sew shoulder seams in edge sts. Collar: Crochet 30 to 45 dc around neckline with Highlander on crochet hook size 8 mm. Continue with 1 dc in each dc until collar measures approx 12-12-12-14-14-14 cm. Cut yarn. Crochet around armhole with Eskimo on crochet hook size 8 mm. Begin mid under sleeve. 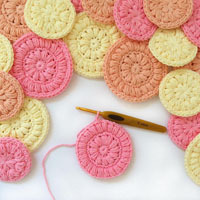 Crochet 1 dc, * 1 ch, skip approx 1 cm, 1 dc in next sts *, repeat from *-* and finish with 1 sl st in dc from beginning of round. Assembly: Sew sleeved on under edge og Eskimo. Sew sleeve and side seams in outermost edge to avoid thick seams. Sew on decorative pockets mid front piece approx 7 to 9 cm from edge mid front. Only sew edge top pocket. Sew in buttons. Crochet edges: Crochet around all edges of jacket with Eskimo on crochet hook size 8 mm. Start mid back of neck. Crochet 1 dc, * 1 ch, skip approx 1 cm, 1 dc in next sts *, repeat from *-* around collar, down along front piece, around bottom edge and up along front piece and back neck again. Finish round with 1 sl st in the first dc from beginning of round. Crochet in same way along bottom sleeve and around loose edge of pockets. Slanted sts: Sew slanted sts with 2 threads Eskimo under breast (i.e. approx 32-34-36-38-40-42 cm down from shoulder) – sts should reach approx 2 x 2 cm.